When investigating the numerous online fake anaconda photographs exposed by me in my previous ShukerNature blog article (click here to access it), I frequently encountered various permutations of another fake snake image – the most abundant example of which opens this present ShukerNature article. Moreover, I soon discovered that they also frequently featured as video-thumbnail photographs for various YouTube videos concerning giant snakes, but invariably they were conspicuous only by their absence within the videos themselves. In short, they were simply being used as clickbait (just like the fake anaconda ones), enticing potential viewers to access the videos. 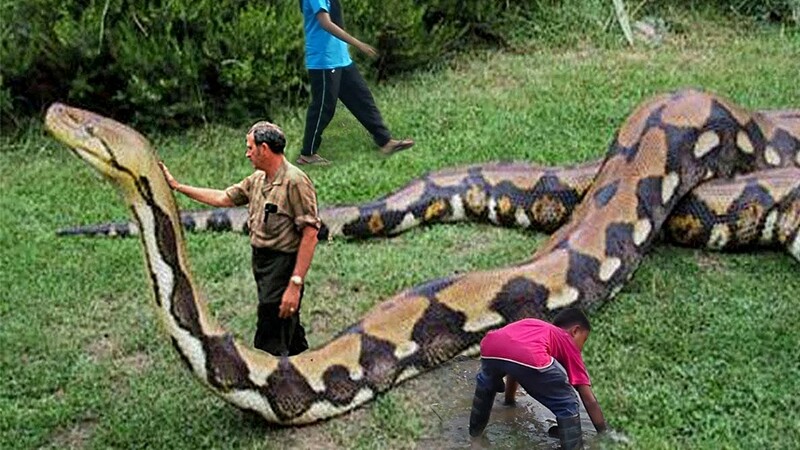 The snake portrayed in these fake photos is readily recognisable as a reticulated python Python reticulatus. 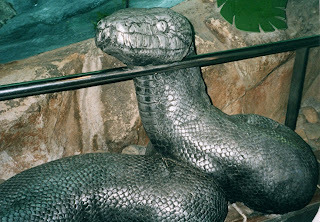 Now, I am well aware that this species is the world's longest species of modern-day snake, with specimens regularly exceeding 20.5 ft, but even the current confirmed record-holder – a truly astonishing individual 32 ft 9.5 in long that was shot in 1912 on the Indonesian island of Sulawesi (=Celebes) – would not measure up in any sense of those words to the monstrous mega-python in the photographs under consideration here. Moreover, even forced perspective would be sorely challenged to yield a size-based visual illusion anywhere near as spectacular as the serpent depicted in them. 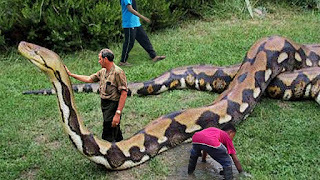 Clearly, therefore, these photos were fakes, produced by adding small images of humans into some original, genuine photograph of a reticulated python in order to make the latter snake appear immense, but the only way to verify this was to trace that original, genuine photo. 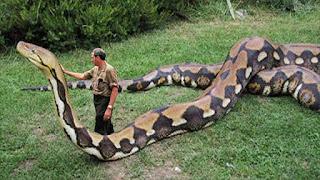 Happily, however, unlike the search for the original anaconda image, finding this python precursor was much easier to accomplish. I soon discovered a version that was identical with the others relative to the python itself but lacked any people in it, only depicting the snake, so this was obviously the original, genuine photo whose image had been appropriated by the hoaxer(s). 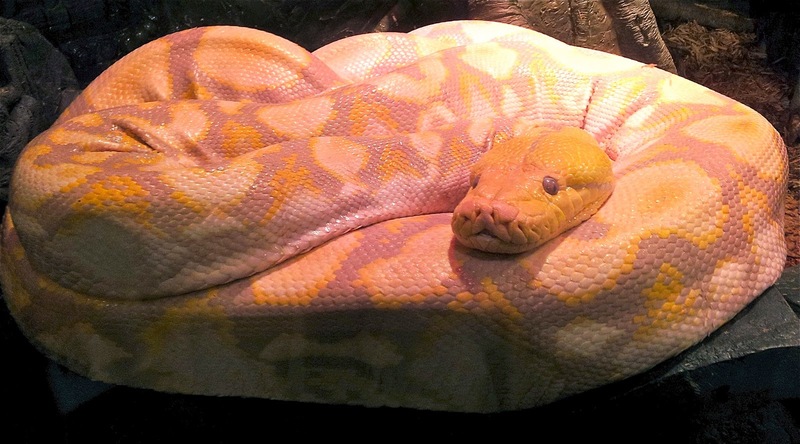 It was present on many sites dealing with snakes, and not surprisingly it was especially popular on southeast Asian sites, because the reticulated python is native to southeast Asia. But none of these sites provided any source for it, so where had this photograph originated? By clicking Mikee's name alongside his post, I was able to access his public profile on RFUK, and I discovered that his real identity was Michael Andrews, from Essex, England. His RFUK profile also included links to his Facebook page, and when I accessed this I found the same python photograph in one of his FB photo albums too (it is publicly accessible, so click here to view this python photo in it). The album in question is entitled 'My Passion', and is devoted to photographs of various of Michael's pet reticulated pythons. The specific python photograph under investigation by me here had been uploaded into this FB album by Michael on 17 May 2010. Consequently, the mystery of the mega-python image is a mystery no longer – Michael's original, genuine photograph of one of his pet reticulated pythons has simply been photo-manipulated by creator(s) unknown, and without Michael's knowledge, to produce a range of fake pictures of purportedly gargantuan pythons that have flooded the internet and are proving particular popular as clickbait images for uploaded videos there. Interestingly, however, using TinEye's Reverse Image Search the earliest fake version that I was able to track down online had been uploaded on 16 May 2016, so unlike the fake anaconda photos these python equivalents seem to have been created only fairly recently. AMAZING ANIMALS IN AN AMAZING NEW BOOK!